We hope you are all having a safe and Happy Halloween! 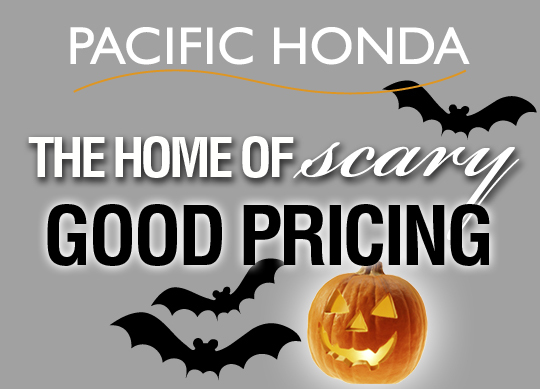 Here at Pacific Honda we pride ourselves on our scary good pricing! No tricks, only treats! 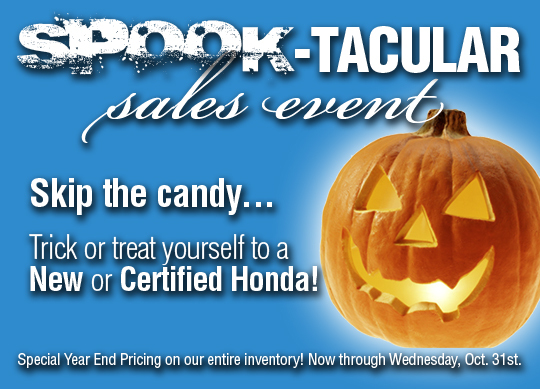 We have incredible deals on your favorite Honda models. Stop by the dealership or check out our specials online. It's that time of the year - our prices are scary low and the deals are frighteningly good! 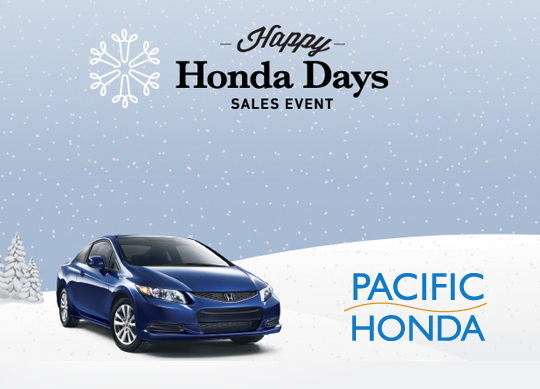 Come to Pacific Honda to see all of the incredible year-end deals on New and Certified Honda models! No tricks here...only treats! 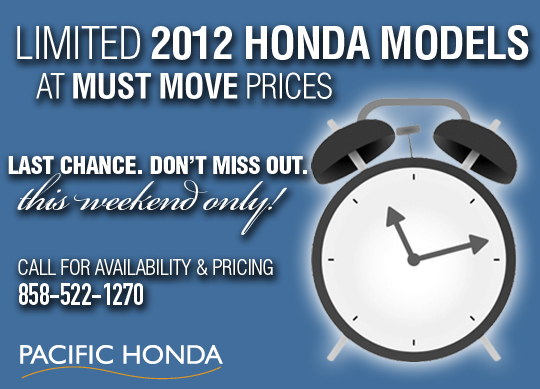 Visit PacificHonda.com to see more of our specials. 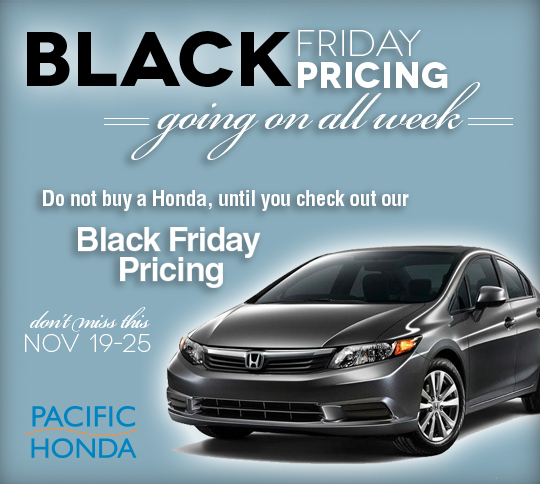 Now, luxury is affordable at Pacific Honda! 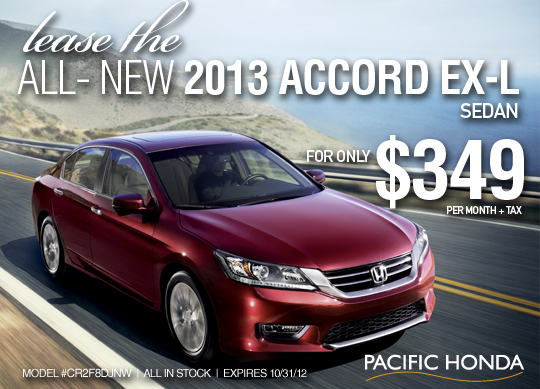 Lease the all-new 2013 Honda Accord EX-L sedan for only $349 per month (plus tax). The 2013 Accord has more luxury features and incredible safety features than ever before. For a record 26th time, the Accord has been named one of the 10Best Cars by Car and Driver magazine.This is a great opportunity to get behind this award-winning sedan! This scary good deal is $349 a month for 36 months (12,000 miles per year) with $999 due at signing. Offer expires 10/31/2012. 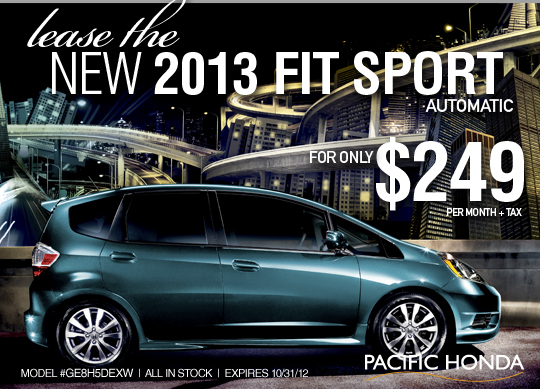 The 2013 Honda Fit Sport is here and we have an incredible lease offer at Pacific Honda. This scary good deal is $249 a month for 36 months (12,000 miles per year) with ONLY $499 due at signing*. "The top-of-the-line 2013 Fit Sport has many useful features and amenities, including fog lights, "machined surface" 16-inch alloy wheels, a body-colored underbody kit and rear roofline spoiler, and a chromed exhaust finisher for a high-energy look. A rear stabilizer bar and steering wheel-mounted paddle shifters (on automatic transmission-equipped models) widen the performance envelope, while a 160-watt AM/FM/CD audio system with six speakers and illuminated steering wheel-mounted audio controls get the tunes pumping. Other Fit Sport interior enhancements include upgraded seat fabric, dark metallic dashboard components, chrome accents around the instrument displays, console ambient lighting and floor mats." -Details courtesy of Honda. *$249 a month plus tax 36 months. ONLY $499 due at signing (does not include fees). 12,000 miles per year. Expires 10/31/12. Have you been waiting to drive off in the all-new 2013 Honda Accord? Now is your chance! You can't walk away from a lease deal this good! 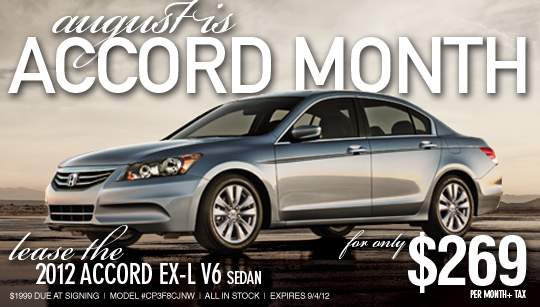 The 2013 Honda Accord LX is only $269 a month plus tax for 36 months. You get 12,000 miles per year and we know you'll enjoy every one of them! 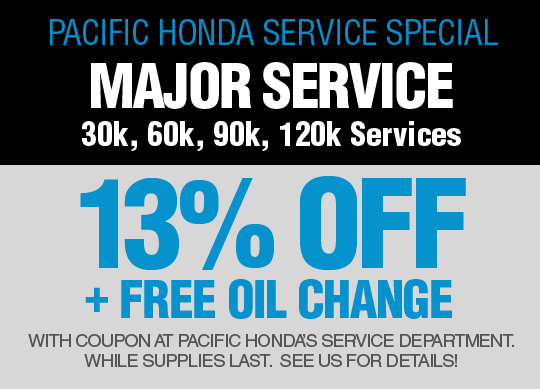 See Pacific Honda for more details. $269 a month plus tax for 36 months. $1199 due at signing. Offer expires 10/31/12. 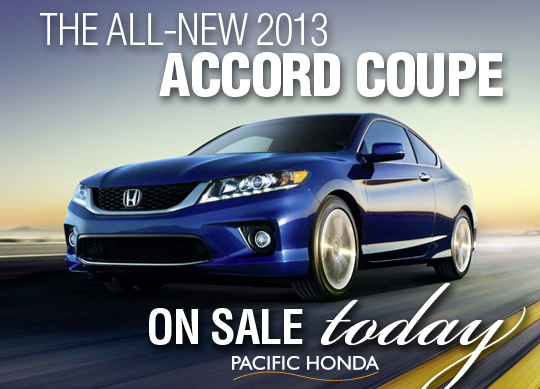 The gorgeous and sleek 2013 Accord Coupe goes on sale today! This beautiful all-new vehicle was previewed over the summer and is now ready to be yours. Stop by Pacific Honda to see and test drive the Accord Coupe today. 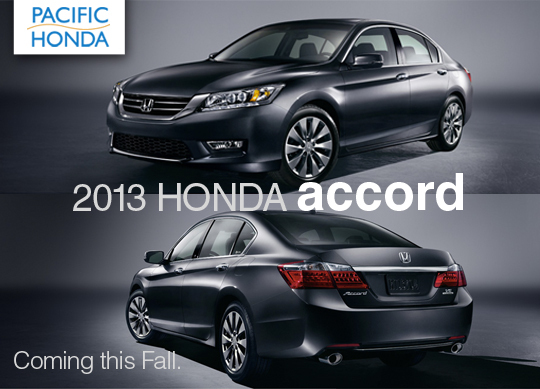 The 2013 Accords have some incredible new features. 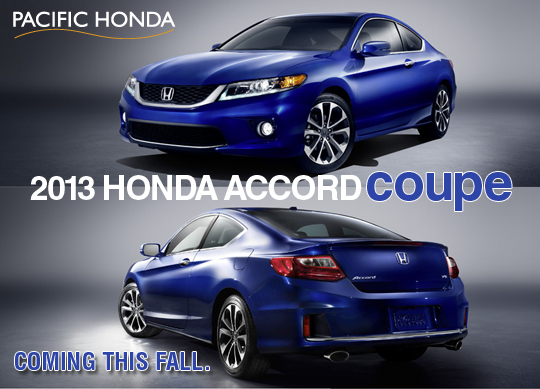 Click HERE for more details on the Accord Coupe or Accord Sedan. 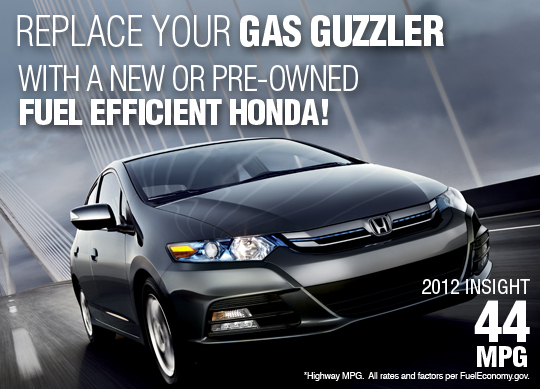 It's time to replace your gas guzzler with a fuel efficient Honda! We have many options to choose from including the Civic Hybrid, CR-Z Hybrid, Fit and Fit EV, Insight Hybrid and the all-new 2013 Honda Accord. 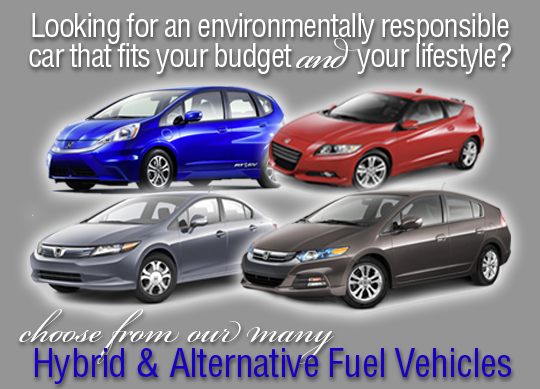 Stop by Pacific Honda today to check out our selection of fuel-sipping Honda models! 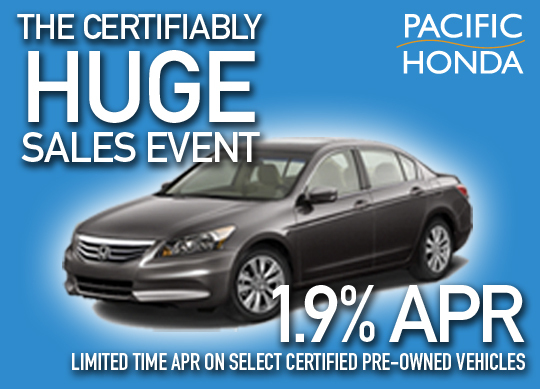 The Certifiably HUGE Sales Event is going on now at Pacific Honda. Take advantage of amazing APR specials for select certified pre-owned vehicles! 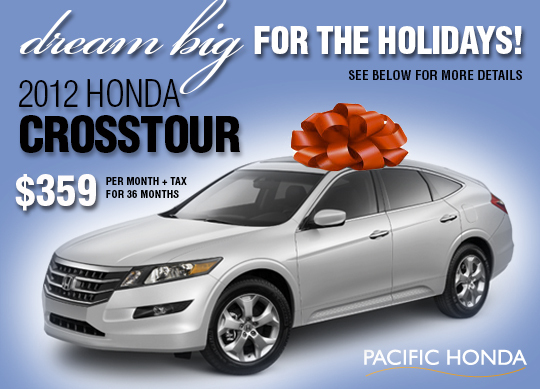 Visit PacificHonda.com to view our inventory or stop by and test drive your dream car today. 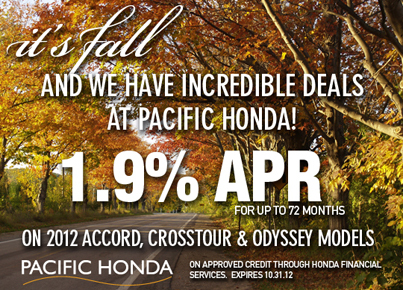 It's FALL and we have incredible new specials here at Pacific Honda. 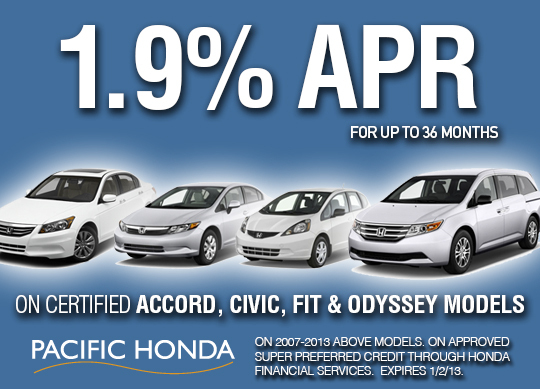 One of those specials is our 1.9% APR for up to 72 months on the Accord, Crosstour and Odyssey models (on approved credit through Honda Financial Services). Take advantage of these offers today. 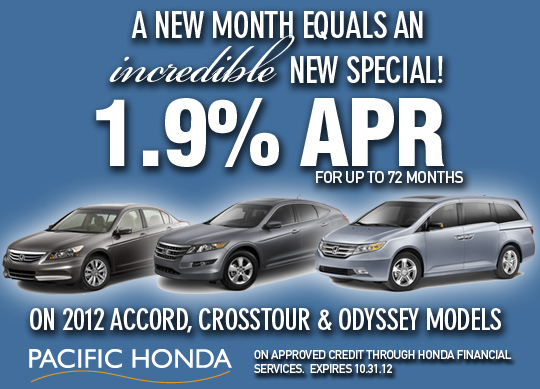 Check out PacificHonda.com for our other finance and lease specials! 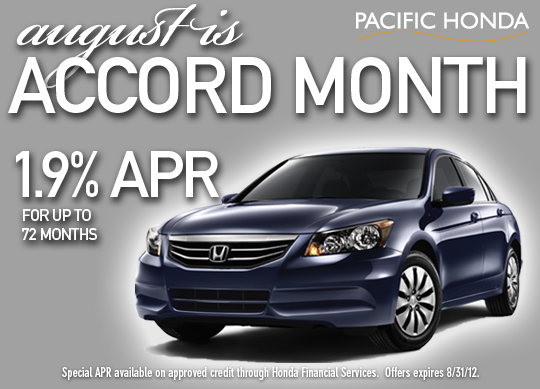 August is ACCORD Month here at Pacific Honda! 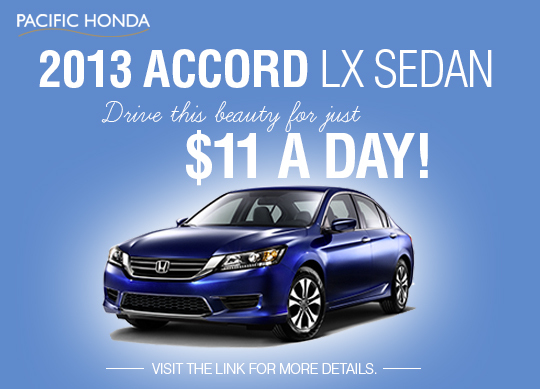 We have a goal to sell 100 Accords in August...and we're not letting price get in the way! 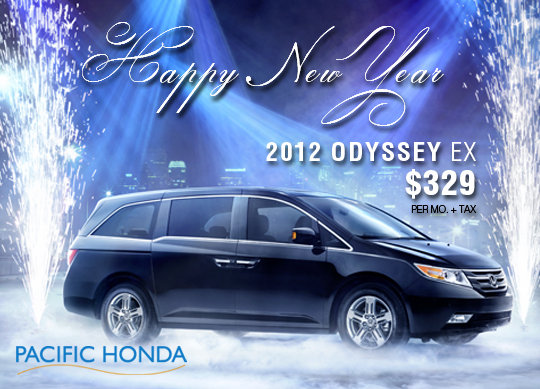 Take advantage of excellent lease offers starting at $217 per month (plus tax) for 36 months with ZERO due at signing! (Accord LX Sedan, 36 months, 12,000 miles per year, does not include government taxes and fees). Or, take a look at our incredible interest rate of 0.9% for up to 60 months (with approved credit). 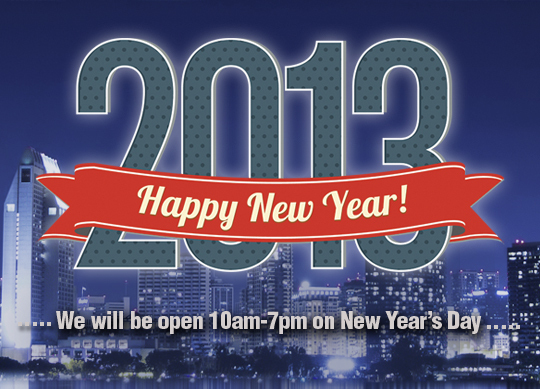 See more at Pacific Honda. 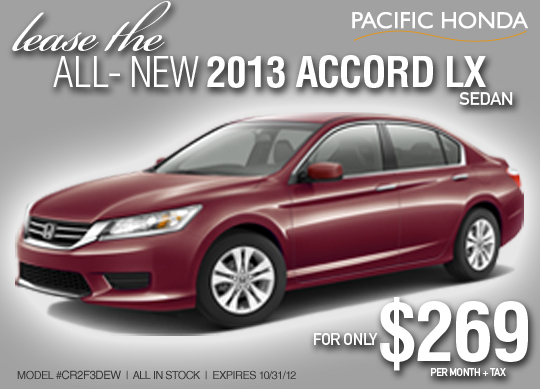 With deals this incredible on Accord models, which one will you choose? Click to learn more about which Accord suits you best. 2012 Honda Civic Tour Featuring Linkin Park and Incubus! Are you ready for the 2012 Honda Civic Tour featuring Linkin Park and Incubus?! In addition to the two headliners, the Civic Tour will also feature the Grammy®-nominated electro-rock band MuteMath! The Tour stops in San Diego on 9/10 @Cricket Wireless Amphitheatre and tickets are still available. Will we see you at the show? 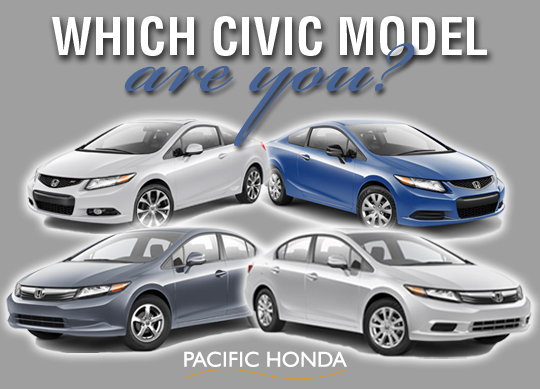 For more info on Civic models click here or visit Pacific Honda. The ninth-generation Accord is a stunning combination of style and sophistication. Not only do the Accord Sedan and Coupe sport dynamic new exterior and interior designs, but they also show off a host of new technologies. Some of those technologies include: Lane Departure Warning (LDW), Forward Collision Warning (FCW) and the Honda-exclusive LaneWatch™ blind spot display. The new Accord also introduces HondaLink™, a cloud-based system that connects you to Bluetooth® Streaming Audio, Pandora® internet radio SMS text message function and all your favorite digital content without hassling with your mobile phone. The available Aha™ feature on HondaLink gives you access to personalized restaurant searches, Facebook audio feeds, audiobooks and more via the audio system interface and voice recognition. 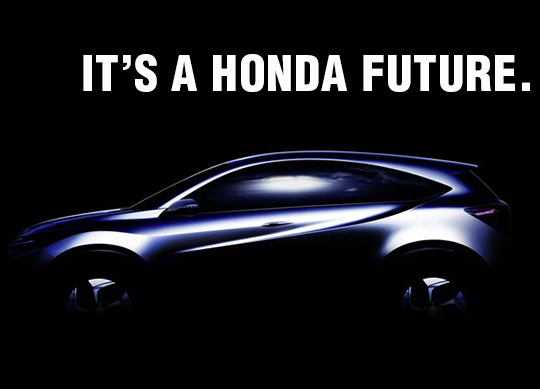 To see more and sign up to receive updates for this incredible new vehicle, visit http://automobiles.honda.com/future-cars/. Photos and content courtesy of Honda. Standard on EX-L and above. LDW only alerts drivers when lane drift is detected without a turn signal in use. LDW may not detect all lane markings or lane departures; accuracy will vary based on weather, speed and road condition. System operation affected by extreme interior heat. Driver remains responsible for safely operating vehicle and avoiding collisions. Standard on EX-L and above. FCW cannot detect all objects ahead and may not detect a given object; accuracy will vary based on weather, speed and other factors. System operation affected by extreme interior heat. FCW does not include a braking function. Driver remains responsible for safely operating vehicle and avoiding collisions. Standard on EX Sedan and above and EX-L Coupe and above. Display accuracy will vary based on weather, size of object and speed, and the display may not show all relevant traffic. The display is not a substitute for your own direct visual assessment of traffic conditions before changing lanes. The Bluetooth® word mark and logos are owned by the Bluetooth SIG, Inc., and any use of such marks by Honda Motor Co., Ltd., is under license. Pandora, the Pandora logo, and the Pandora trade dress are trademarks or registered trademarks of Pandora Media, Inc. Used with permission. Compatible with select Apple® iPhone® devices only. Your wireless carrier's rate plans apply. Compatible with select phones with Bluetooth® only. Your wireless carrier's rate plans apply. State or local laws may limit use of texting feature. Only use texting feature when conditions allow you to do so safely. Available on EX Coupe and above and EX-L Sedan and above. Aha, the Aha logo, and the Aha trade dress are trademarks or registered trademarks of HARMAN International Industries. The Accord has been one of the best-selling cars in America since its introduction 36 years ago. And it's poised to continue this tradition when it hits the streets this fall. 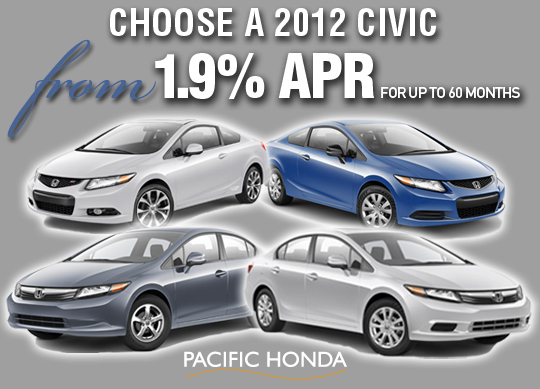 At Pacific Honda, we have some excellent finance specials on 2012 Honda models including the Civic and Pilot. 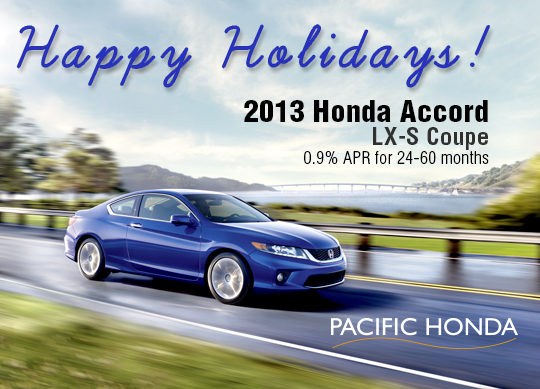 Finance or lease today with Pacific Honda! Offers expire 9/4/2012. On approved credit through Honda Financial Services. 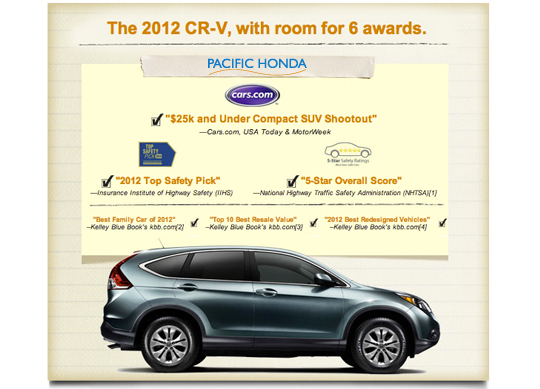 How much do you know about the 2012 Honda CR-V? Click here to see what people are saying about it. 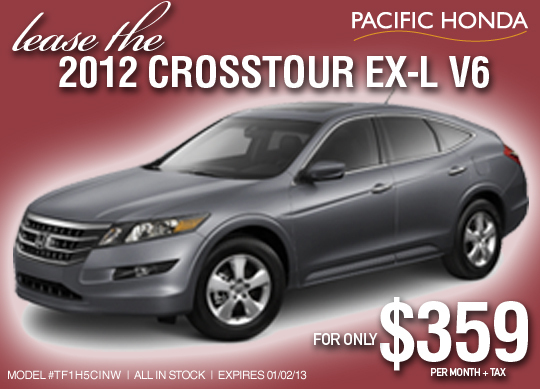 Come in to Pacific Honda to test drive the all-new CR-V today. 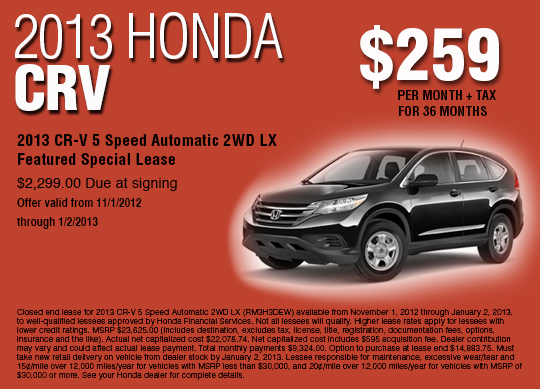 We have special finance rates available along with a special lease offer for this vehicle! 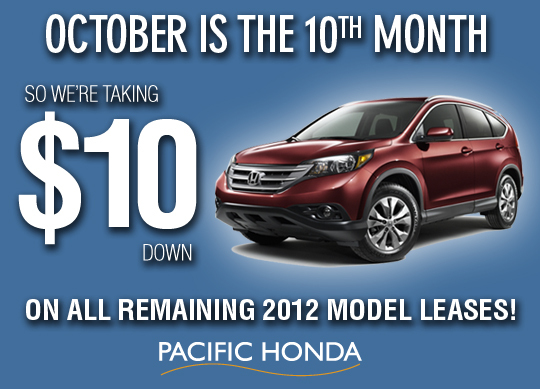 See PacificHonda.com for more details. 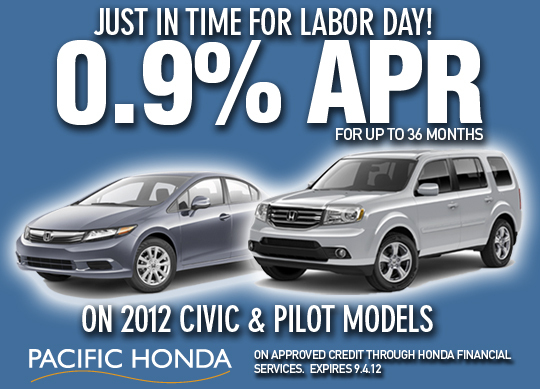 At Pacific Honda, we are celebrating summer with some incredible specials for almost every Honda model! Some examples of these great specials include the 2012 Honda Accord EX Sedan for $246 per month (plus tax) with ZERO due at signing. 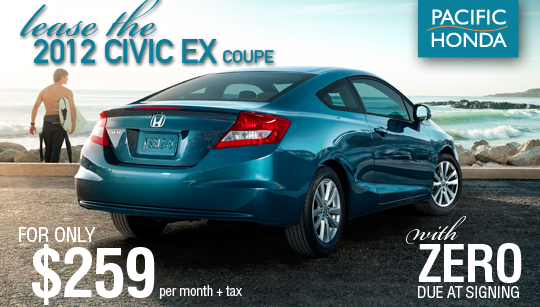 Another example is the 2012 Honda Civic EX Sedan for only $233 per month (plus tax) also with ZERO due at signing. 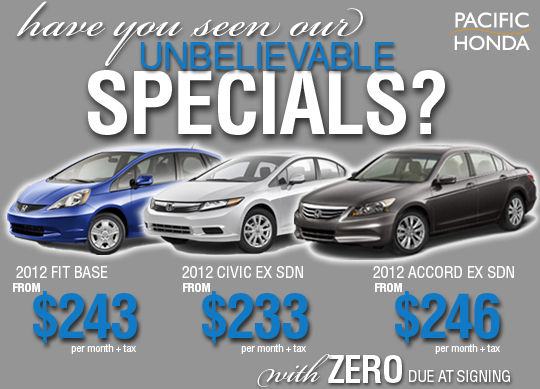 Check out these and many more specials on our Specials Page or stop by Pacific Honda today for a test drive! To find out more about any Honda model, visit http://automobiles.honda.com/. Offers expire 9/4/2012. Prices do not include government fees. 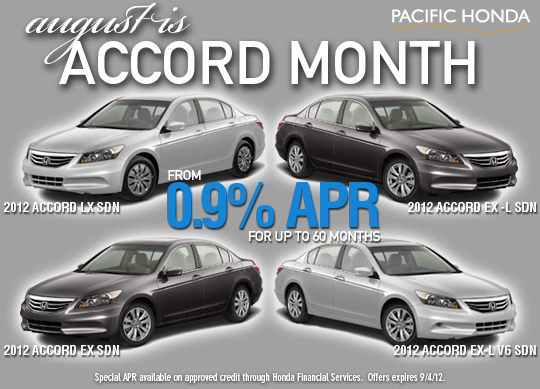 August is ACCORD Month! 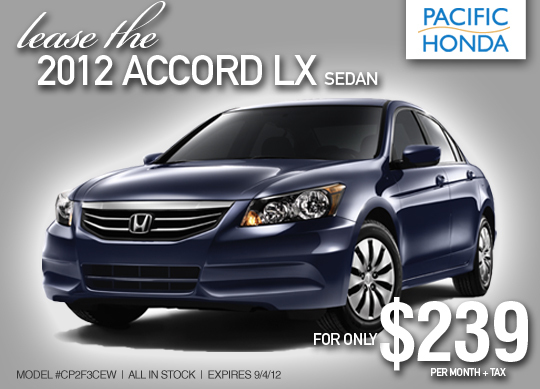 We have a goal to sell 100 Accords in August...and we're not letting price get in the way! Take advantage of excellent lease offers along with an incredible interest rate of 1.9% for up to 72 months (with approved credit). 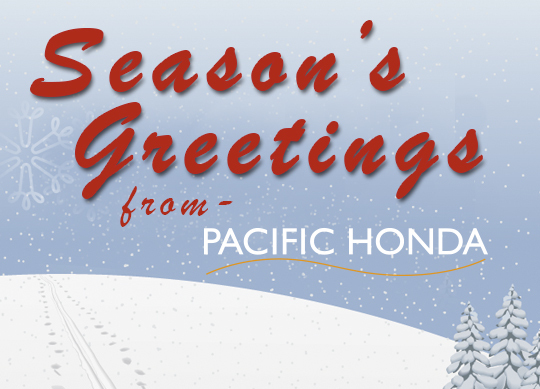 See more at Pacific Honda. Click to learn more about which Accord model suits you best. Now is the time to buy a Honda - during our exciting Summer Clearance Event! Take advantage of special lease offers such as the Honda Accord LX Sedan for only $239 per month with ZERO due at signing. We also have incredible finance specials starting at 0.9% APR for select models (with approved credit). 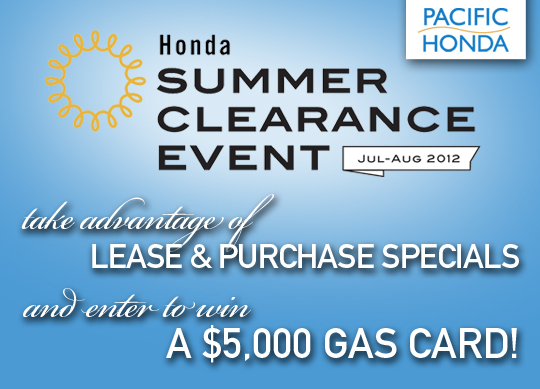 Also, you can enter to win a $5,000 Gas Card by visiting the Honda Summer Clearance website! We are all different. That's why there are many different Civic models for you to choose from. Click to learn more about each different model and how they would fit your life! 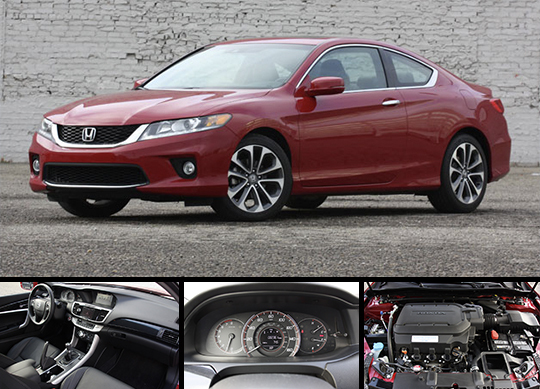 From a sporty Civic Si Coupe to a fuel-sipping 44-mpg Civic Hybrid Sedan, Honda has all the bases covered! 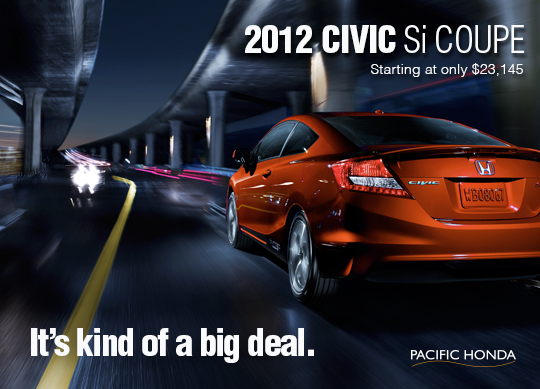 Stop by Pacific Honda today to test drive your new Civic. Take advantage of our Summer Clearance Event lease and finance specials. 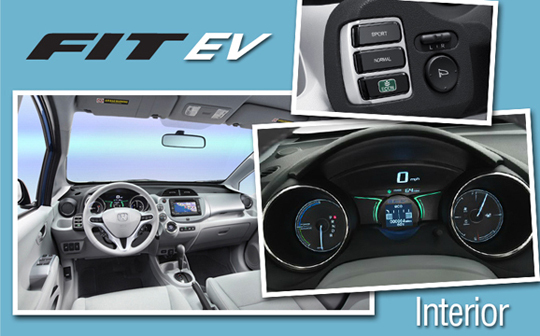 Leasing began for the 2013 Fit EV (Electric Vehicle) on July 20, 2012. 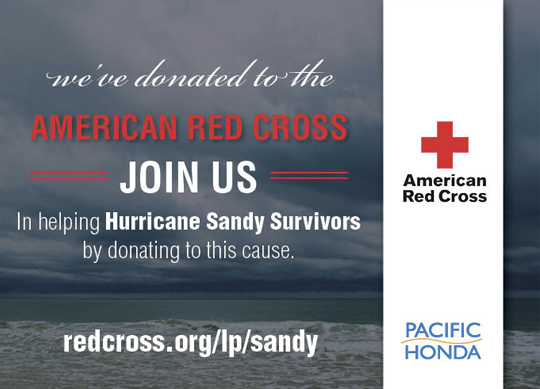 We at Pacific Honda are proud to be a part of this exciting opportunity. 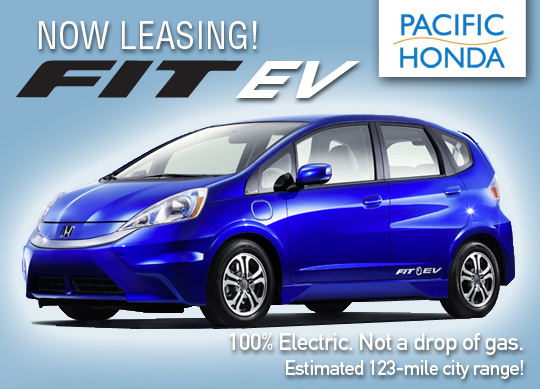 Learn more about the Fit EV and take the Honda Readiness Assessment to see if the Fit EV is right for you! Wouldn't a new Honda vehicle make your summer vacation more comfortable? 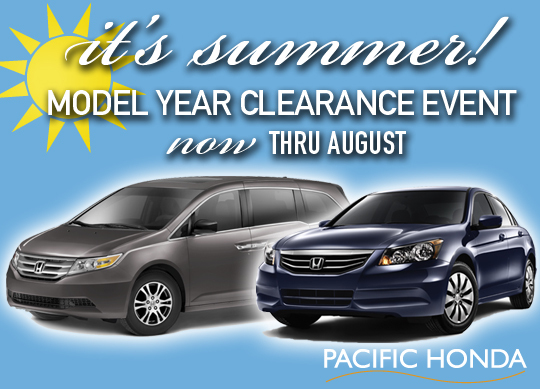 Stop in to Pacific Honda today to take advantage of our Summer Model Year Clearance Event! We have excellent lease specials going on now through August on many different models including the Accord LX Sedan, Odyssey EX-L and many more. 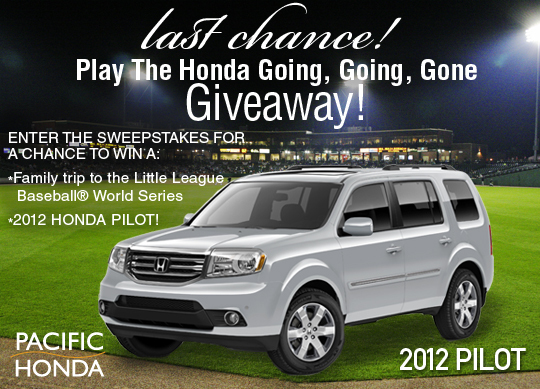 Honda is also donating $5,000 to a local Little League® with the most sweepstakes entrants! And, if you just can't wait to win, play the daily instant win game for your chance to score a Visa gift card or Honda stadium blanket. For details and to enter CLICK HERE. 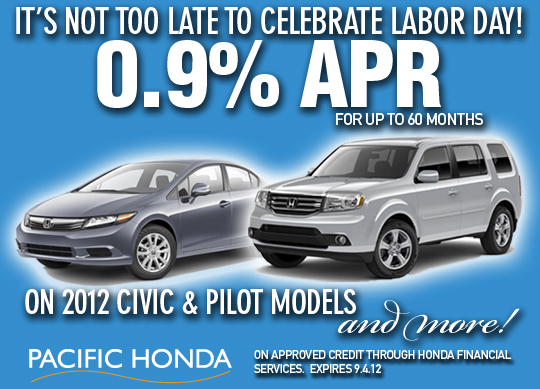 To drive the 2012 Honda Pilot, visit Pacific Honda today! Lease a NEW 2012 Honda Accord Sedan LX Automatic! We hope you are all having a safe and happy July 4th! 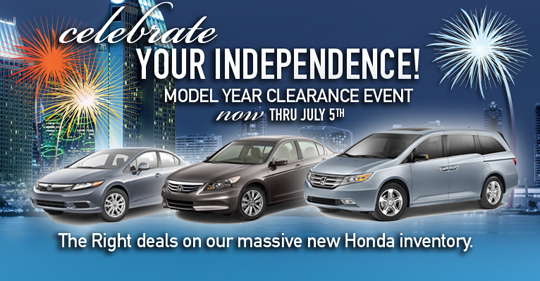 Celebrate your Independence with Pacific Honda. Take advantage of our Model Year Clearance and special financing offers! 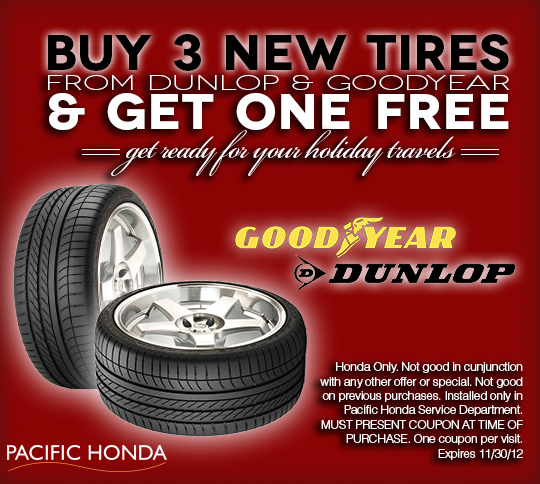 Stop by Pacific Honda to take advantage of these offers.